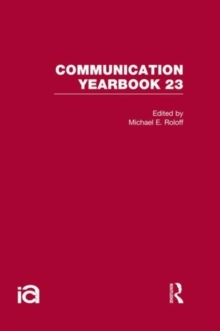 Communication Yearbook 23, originally published in 2000 includes discussions about the relationship between communication and the emotional processes. The authors do not confine the reviews to research conducted in a single context, but instead draw upon scholarship that informs about shame and guilt in intimate, family, organizational and public discourse. Also explored is literature on compliance resistance and the emotional reactions that accompany resistance. Other reviews address issues involving communication about sexual harassment in the workplace, cross-cultural influences on management styles, and the mass media's role in encouraging change in body shape. Offering a tremendous variety of in-depth analyses of communication scholarship in a broad array of research areas, this is a vital sourcebook for researchers, teachers and students alike.